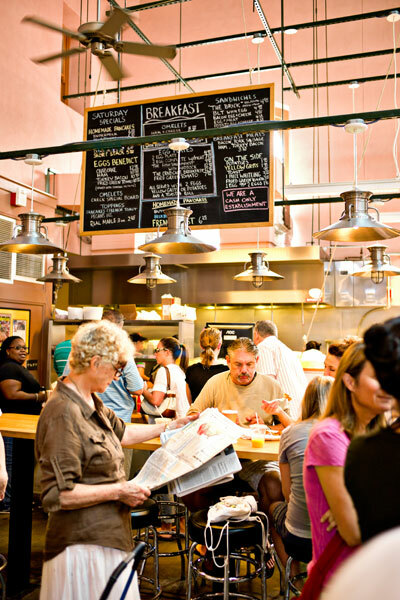 The busy morning scene at Market Lunch in Capitol Hill’s Eastern Market. Photograph by Scott Suchman. 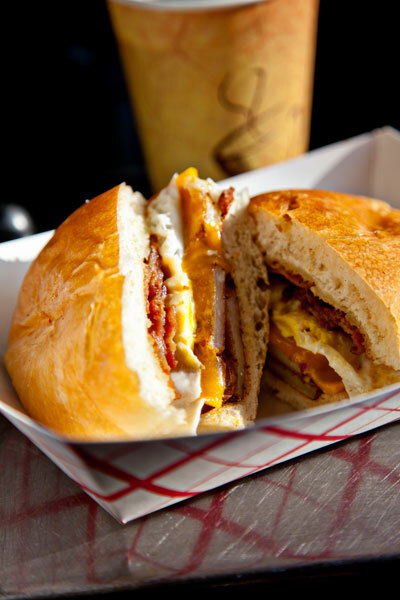 A carb-lover’s dream at Market Lunch: the “brick” sandwich with bacon, eggs, and fried potatoes. 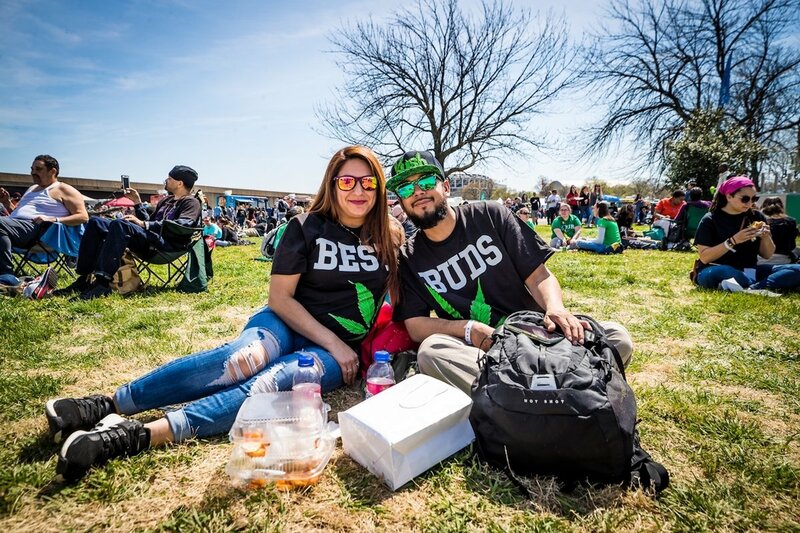 Photograph by Scott Suchman. 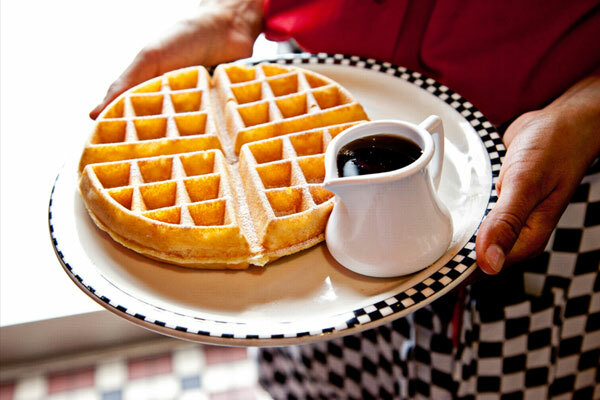 Thick, fluffy Belgian waffles at the Silver Diner. Photograph by Scott Suchman. 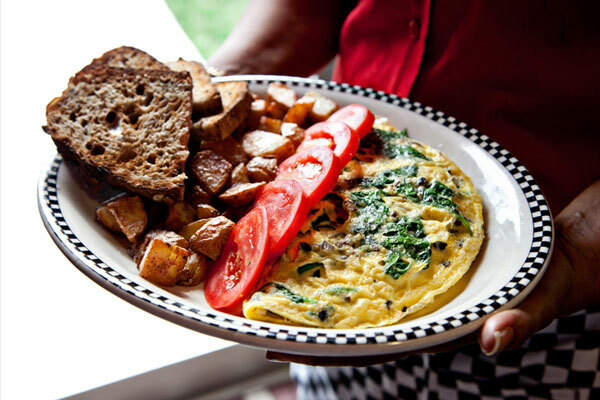 Silver Diner’s spinach-and-feta-laced omelette is sided with home fries and sliced tomatoes. Photograph by Scott Suchman. 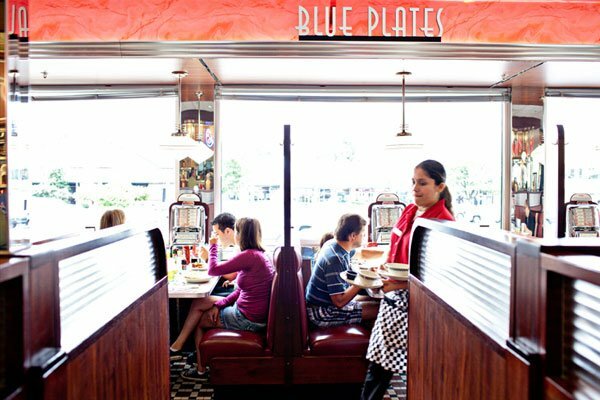 Jukeboxes and checkered floors give a retro vibe to the Silver Diner. 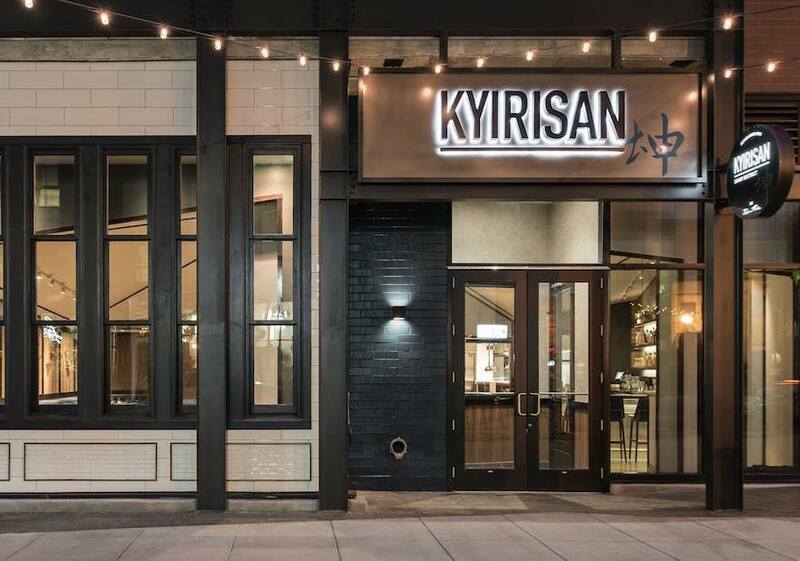 Photograph by Scott Suchman. 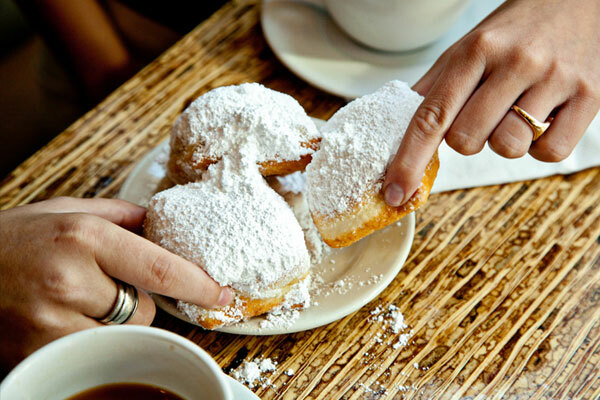 Warm beignets are showered in powdered sugar at Bayou Bakery. Photograph by Scott Suchman. 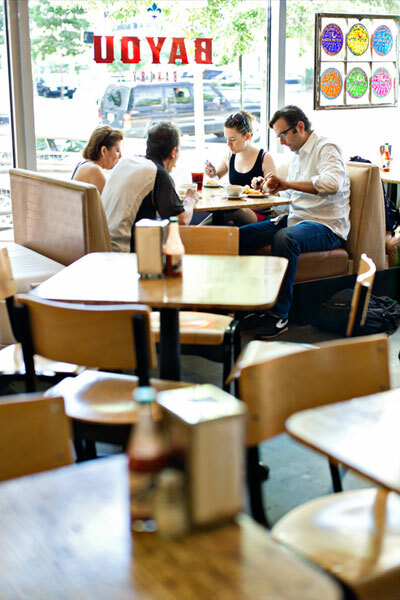 Starting their day the New Orleans way at Bayou Bakery. Photograph by Scott Suchman. 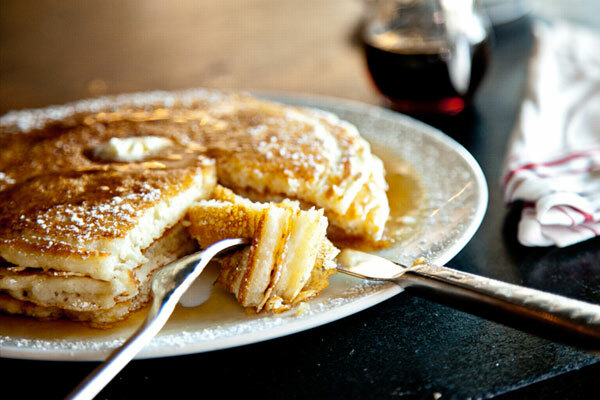 Buttermilk pancakes drenched in butter and maple syrup at Founding Farmers are simple and wonderfully satisfying. Photograph by Scott Suchman. 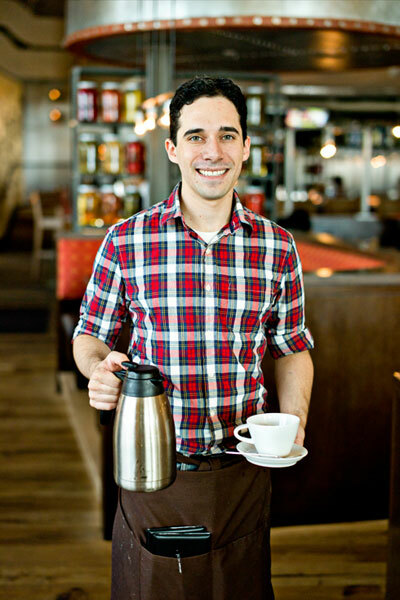 Founding Farmers server Ben Lurye makes the rounds with coffee. Photograph by Scott Suchman. 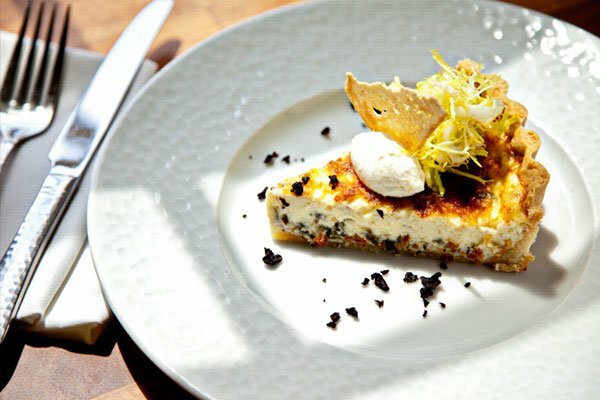 A French classic—bacon-studded, eggy quiche lorraine—at Brasserie Beck. Photograph by Scott Suchman. 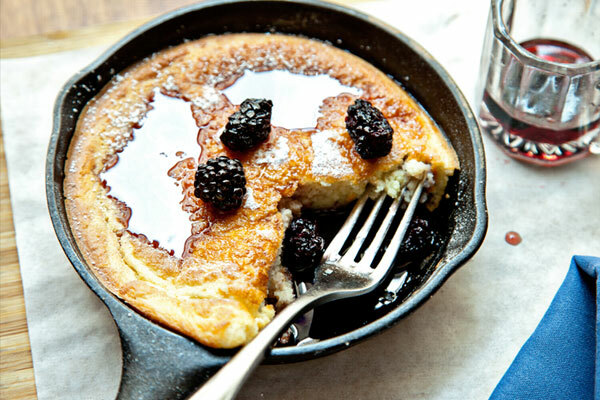 Brasserie Beck’s airy lemon-souffle pancake, served in a cast-iron skillet, gets a drizzle of blackberry-maple syrup. Photograph by Scott Suchman. 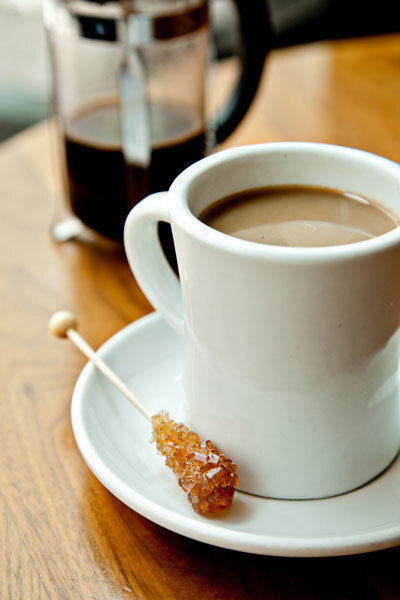 Brasserie Beck’s coffee comes with a rock-candy stirrer. Photograph by Scott Suchman. 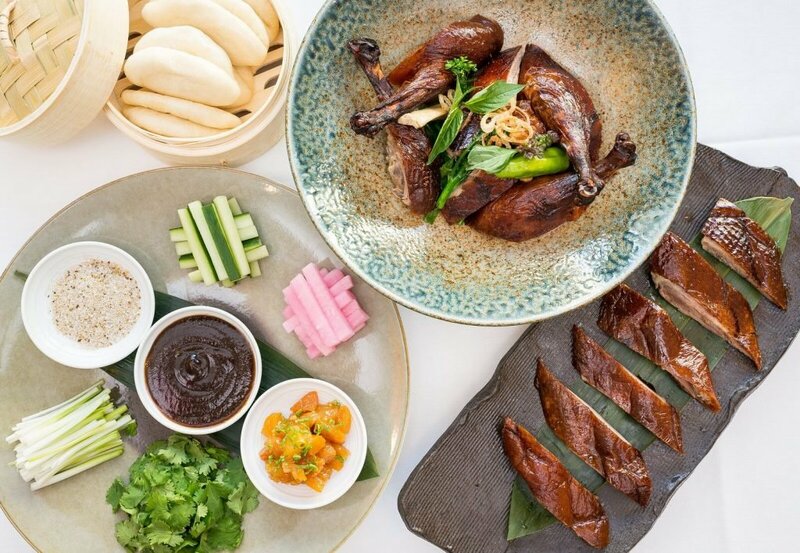 Can’t decide between sweet or savory? 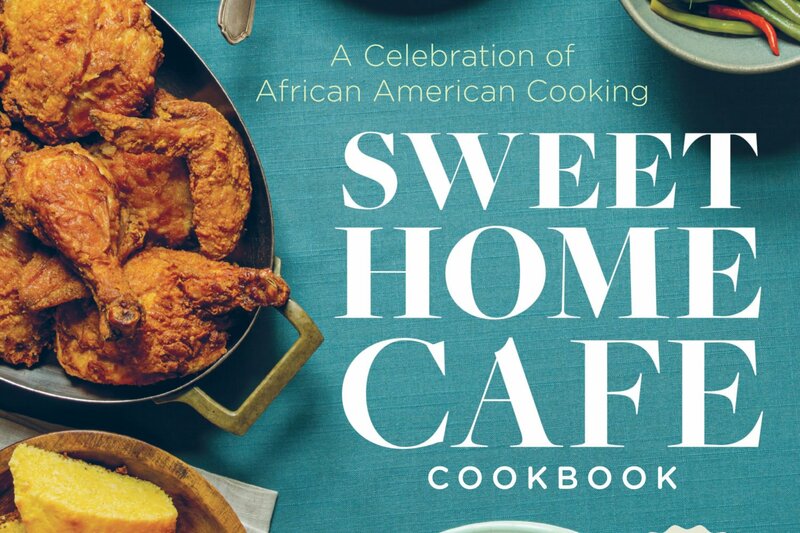 Go for Columbia Firehouse’s fried chicken and Belgian waffles with honey. Photograph by Scott Suchman. 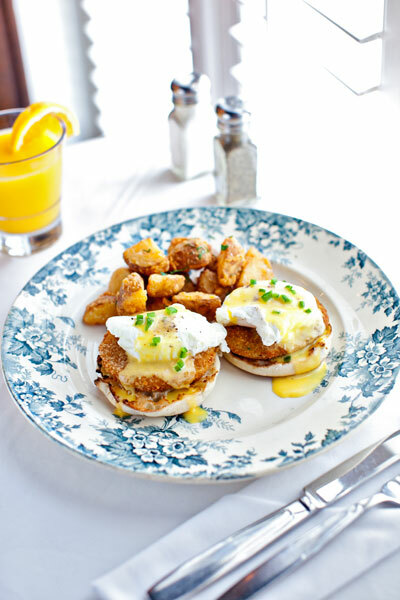 Eggs benedict with a Southern twist—fried green tomatoes—at Columbia Firehouse. Photograph by Scott Suchman. 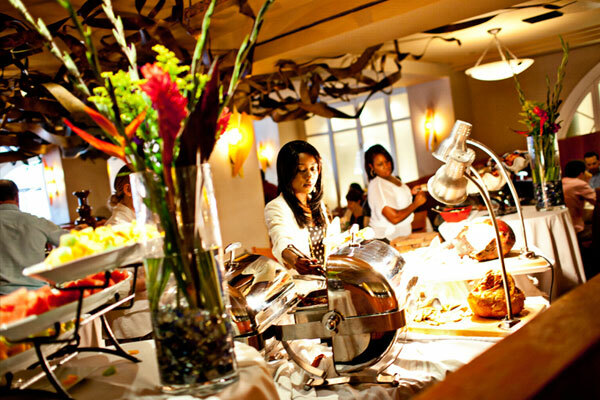 Brunch at Georgia Brown’s starts with a bountiful buffet. Photograph by Scott Suchman. 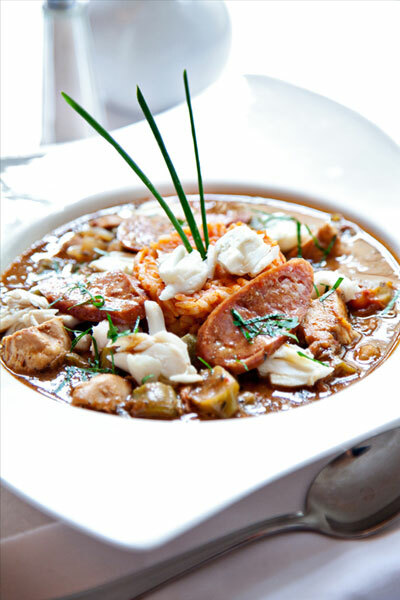 Carolina gumbo with andouille sausage, shrimp, crab, and duck at Georgia Brown’s. Photograph by Scott Suchman. 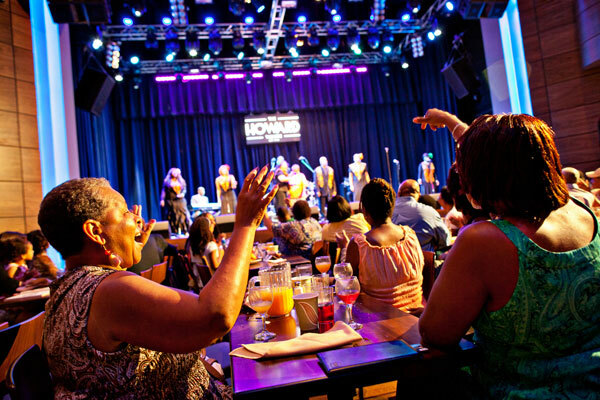 Cheering on the soaring voices at the Howard Theatre. Photograph by Scott Suchman. 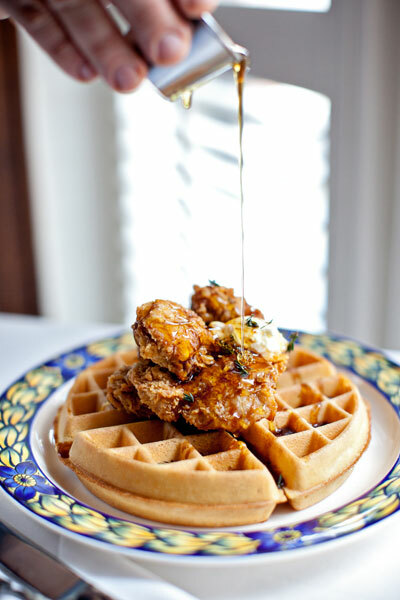 The party starts early at Perrys in Adams Morgan, where you’ll find a drag show along with your eggs and waffles. 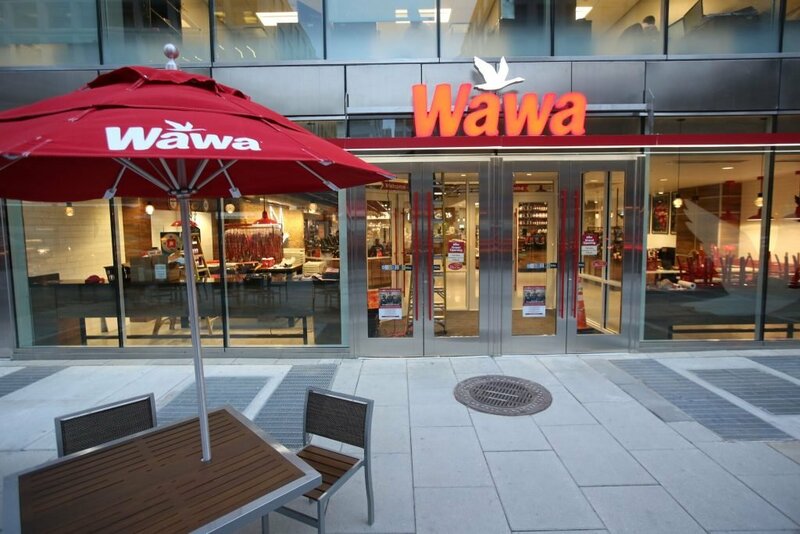 Photograph by Scott Suchman. 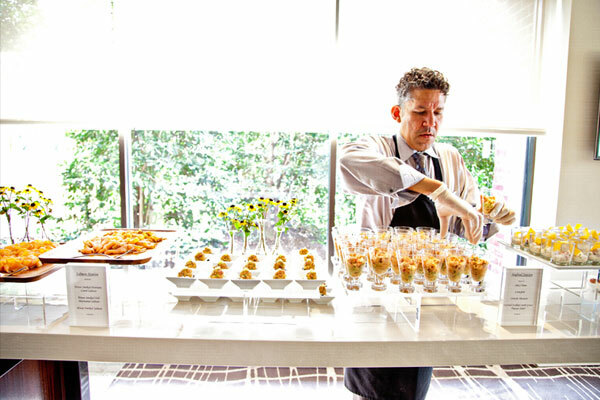 The extravagant seafood station at Seasons in the Georgetown Four Seasons. 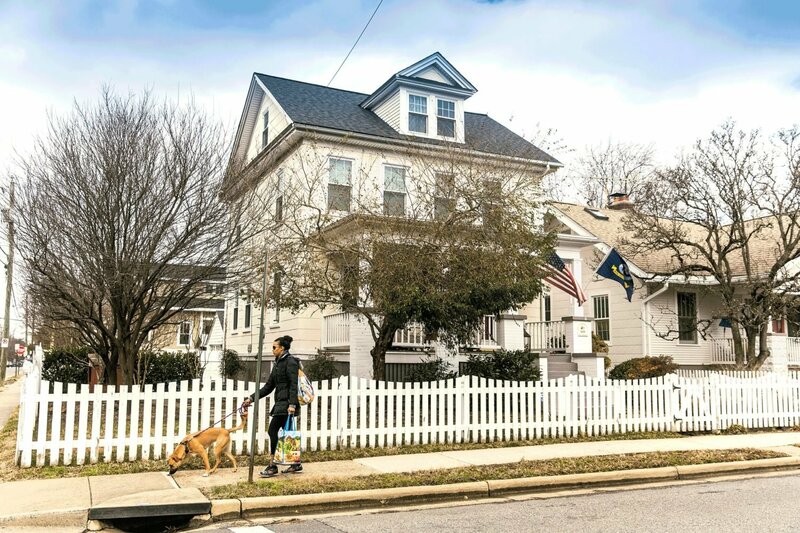 Photograph by Scott Suchman. 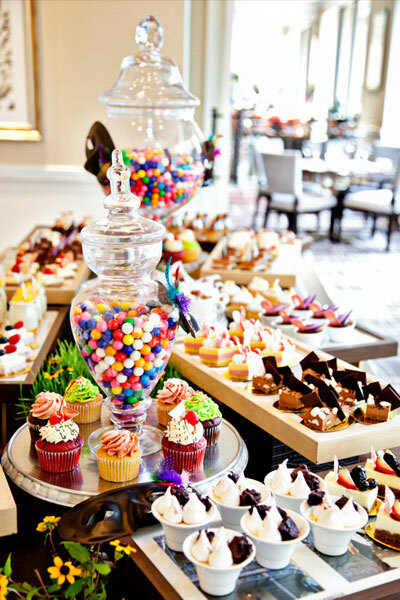 At Seasons’ all-you-can-eat brunch, you’ll find a sweets buffet Willy Wonka would be proud of. Photograph by Scott Suchman. 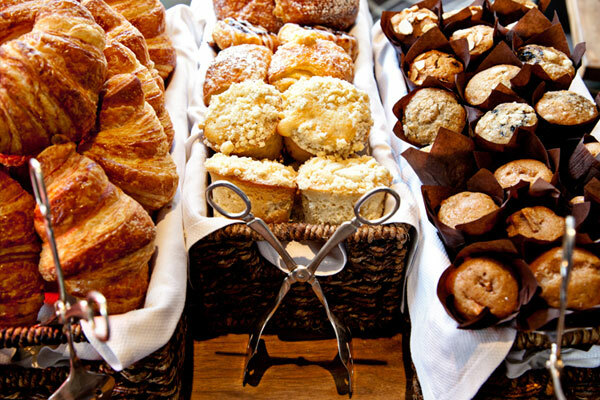 At Seasons, pile your plate with as many muffins and croissants as you can handle. Photograph by Scott Suchman. 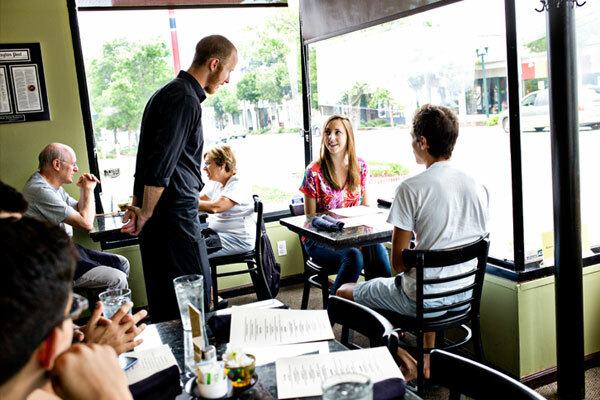 One of the area’s prettiest daytime dining rooms is at Trummer’s on Main in Clifton. Photograph by Scott Suchman. 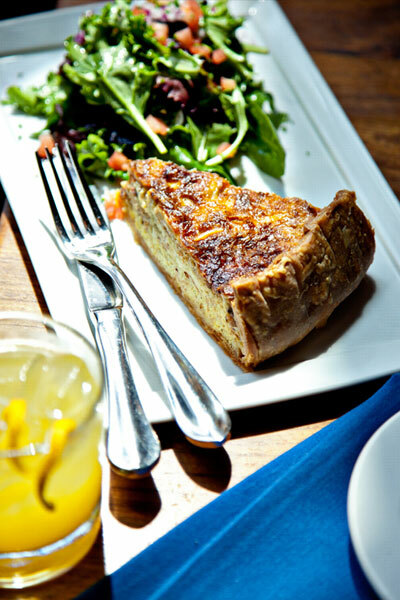 A wedge of quiche lorraine at Trummer’s on Main. Photograph by Scott Suchman. 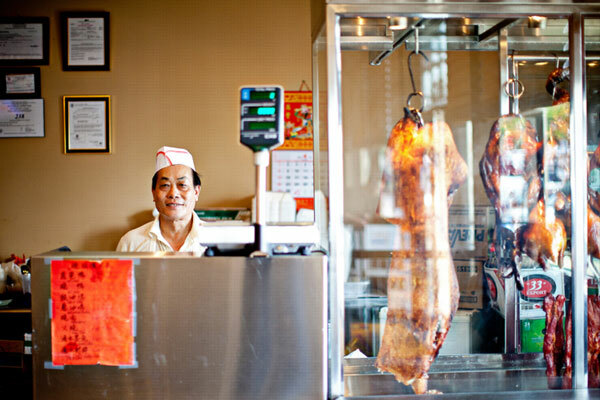 At Falls Church dim sum spot Hong Kong Pearl, Mei Cheng Zuo shows off the excellent roasted meats. Photograph by Scott Suchman. 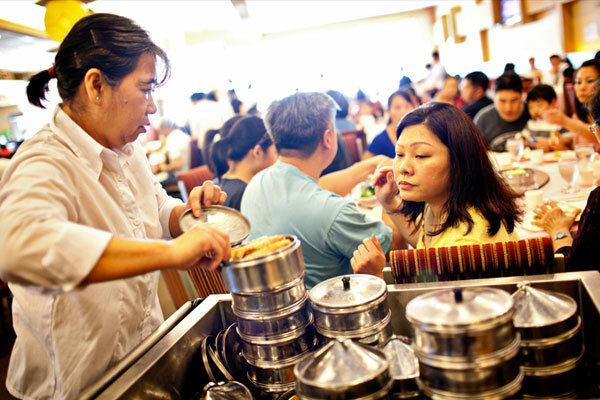 With rolling carts and crowds of customers, the dim sum scene at Hong Kong Pearl is happily chaotic. Photograph by Scott Suchman. 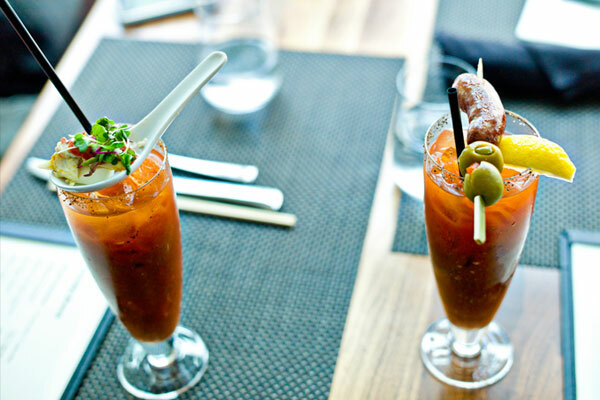 At the Source, get your bloody mary with horseradish panna cotta or a half-smoke. Photograph by Scott Suchman. 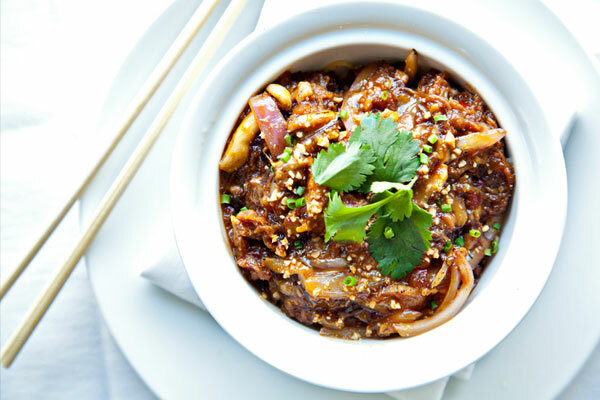 Flavorful dan dan noodles with roast pork and peanuts at the Source. Photograph by Scott Suchman. 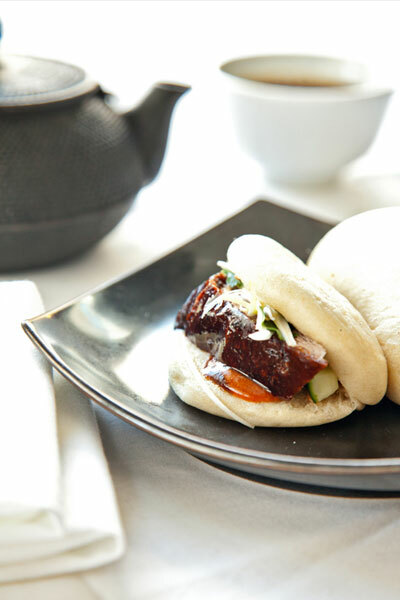 Darkly lacquered duck fills the Source’s soft Chinese-style bao buns. Photograph by Scott Suchman. 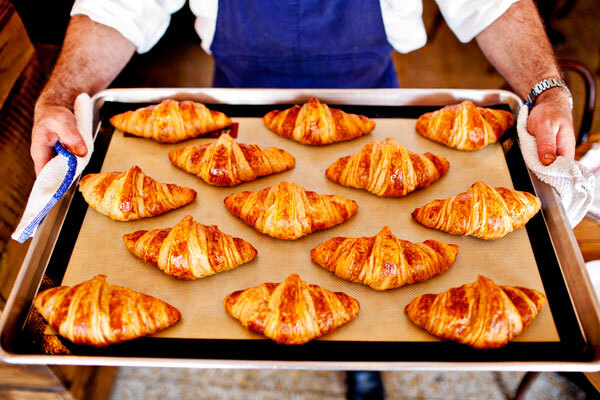 Warm-from-the-oven croissants at Mintwood Place in Adams Morgan. Photograph by Scott Suchman. 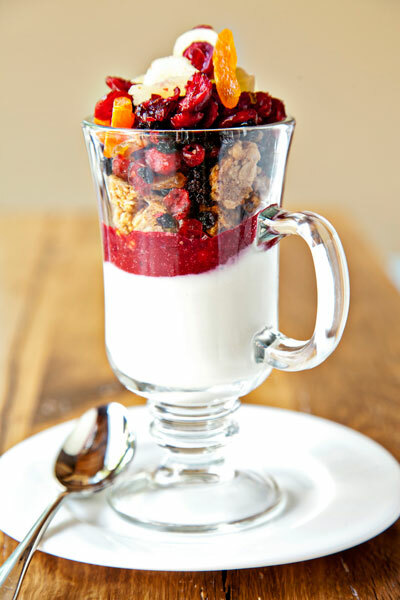 Mintwood Place’s yogurt parfait is layered with dried fruit and granola. Photograph by Scott Suchman. 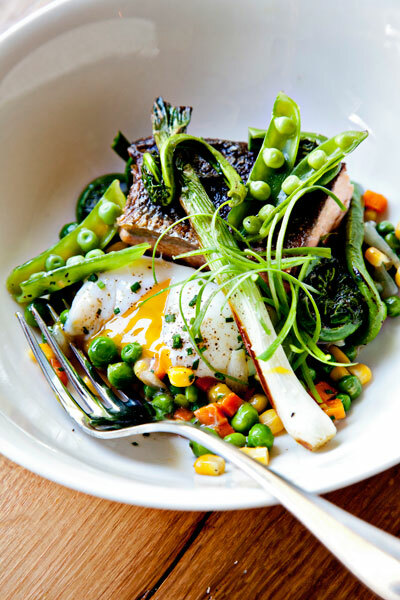 Succotash gets a morning makeover at Mintwood Place, where chef Cedric Maupillier serves it with runny eggs and crispy-skinned salmon. Photograph by Scott Suchman. 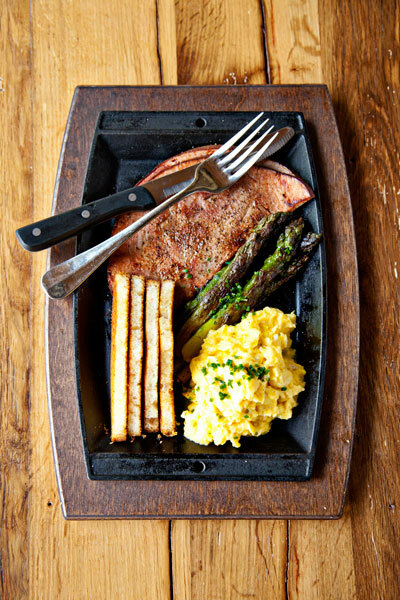 Mintwood Place’s wood-fired ham with asparagus and scrambled eggs. Photograph by Scott Suchman. 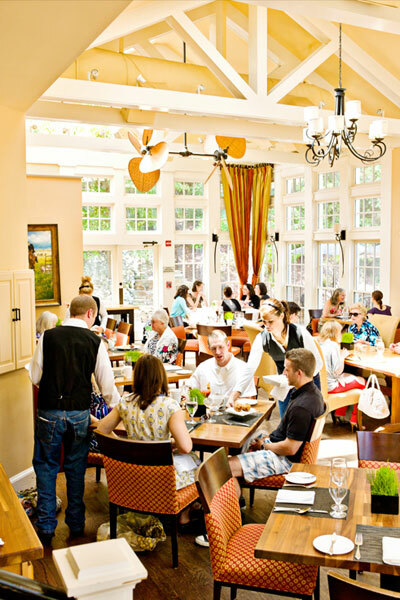 The bustling brunch scene at Maple Avenue in Vienna. Photograph by Scott Suchman. 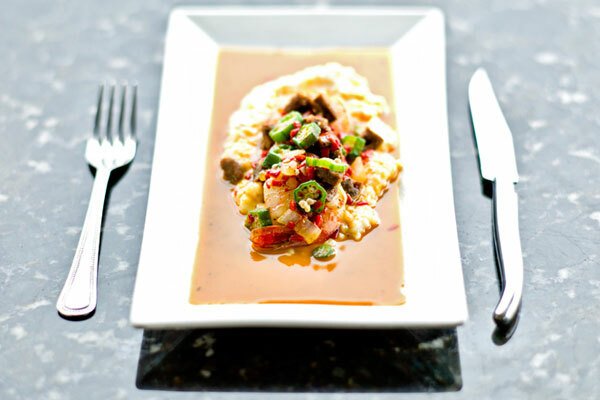 The eclectic brunch menu at Maple Ave includes creamy stoneground grits laden with tiger shrimp, venison sausage, and piquillo peppers. Photograph by Scott Suchman. 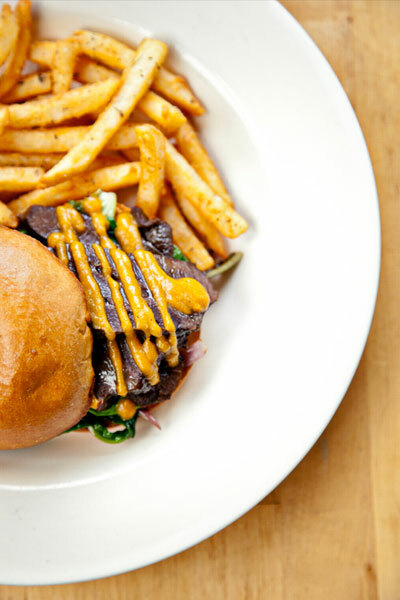 Beer-braised beef cheeks, sauteed onions, and carrot-tomato sauce are piled onto a brioche bun at Maple Ave. Photograph by Scott Suchman. 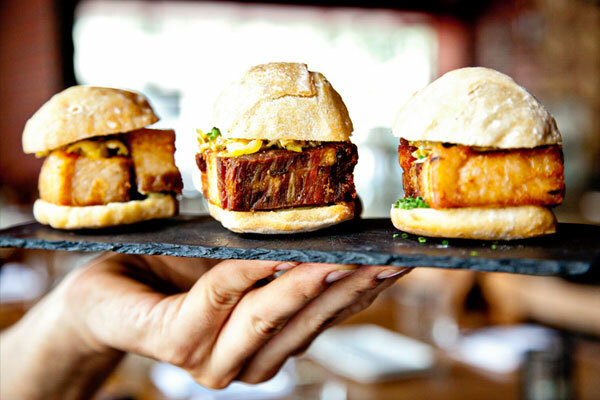 Pickled shishito peppers cut the richness of Estadio’s tiny, aioli-slathered pork-belly sandwiches. Photograph by Scott Suchman. 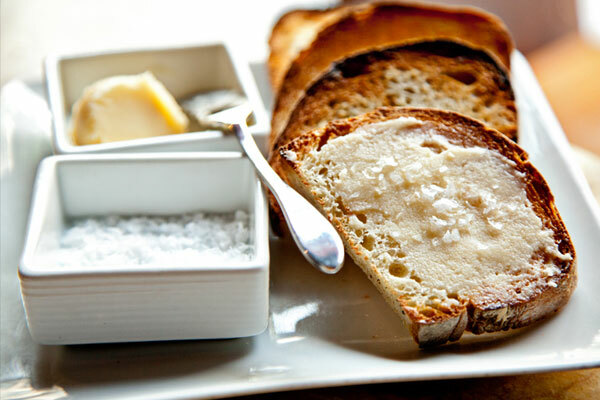 Flaky shards of Malden salt finish off Estadio’s slices of toasted country bread with honey butter. Photograph by Scott Suchman. 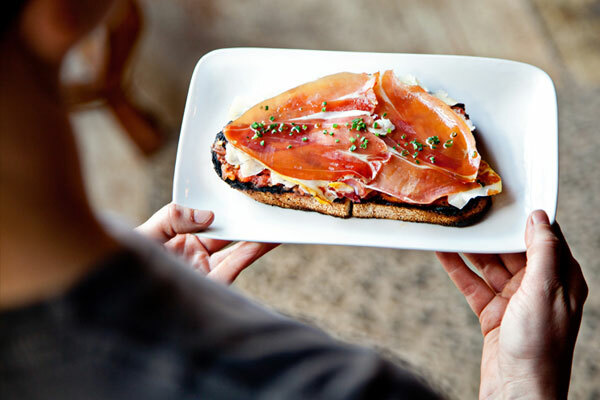 A traditional Spanish trio—serrano ham, manchego cheese, and crushed tomatoes—is layered onto country bread at Estadio. Photograph by Scott Suchman.